New Imaging Technologies' latest logarithmic InGaAs offers short gating mode in QVGA and VGA resolution. The new version of its WiDy SWIR cameras allows low exposure time (down to 200ns) and low jitter (10ns) with minimum trigger delay of 200ns for pulsed illumination. The new cameras have 3 in-pixel memories for true CDS or in VGA - current highest resolution on the market - they come with dedicated software offering programmable trigger delay with customizable very short steps for trigger in or out synchronization. Sony announced a significant downward revision to its full year results forecast in FY2015 due to lower than expected sales in the core image sensor business, caused in particular by slowing growth within the smartphone market. The rate of profit growth in this business is expected to continue to decline through FY2017. Sony plans to take an approach to management that prioritizes speed of response to changes in the market environment, and focuses on Sony's areas of strength. At the same time, in terms of image sensors for mobile products, while the smartphone market itself is slowing, the shift to dual-lens cameras and the requirement for higher pixel density is expected to lead to increased demand in the future. With its technological expertise in these areas, these could be favorable market trends for Sony. By taking advantage of these shifts in the business landscape and also by continuing its existing efforts to expand sales volume, Sony is aiming to revitalize the profitability of this business from the second half of FY2016 and into FY2017. From a mid-to-long-term perspective, Sony continues to expect significant future growth for the image sensor-business. This business accordingly continues to be positioned as a growth driver. In terms of new image sensor applications, Sony sees potential growth in surveillance cameras, as well as in factory automation, IoT (Internet of Things) including drones, and automotive applications. While it is expected to be some time before Sony's image sensor business for automotive applications is fully established, it is an area where Sony anticipates growth and is investing in R&D aggressively. Huffington Post publishes an interview with Almalence CEO Eugene Panich. His response on the question "Where are mobile phone cameras headed in the next five years?" Array cameras, from many small cameras placed in a small array, to an array of big (normal mobile size) cameras occupying large part of phone. IEEE Standards Association (IEEE-SA) forms Automotive Image Quality Working Group. IEEE P2020 standard addresses the fundamental attributes that contribute to image quality for automotive Advanced Driver Assistance Systems (ADAS) applications, as well as identifying existing metrics and other useful information relating to these attributes. Those who want to join the project should contact the Working Group Chair, Robert Stead. The drop in utilization is explained by too much "concentration on one customer"
"A coupling effect is generated between adjacent analog-to-digital converters by parasitic capacitance that is present between the adjacent analog-to-digital converters. In particular, the coupling effect which is increased as a difference between pixels signals becomes large increases non-linearity of each of analog-to-digital converters. 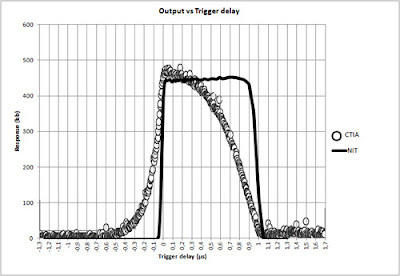 The non-linearity is one of sources of errors of an analog-to-digital converter." BusinessWire: LFoundry (Italy) and its investor Marsica Innovation S.p.A. (MI) announce the agreement to sell to SMIC a 70% stake of LFoundry for 49M Euros. At the closing, SMIC, LFoundry and MI will own 70%, 15% and 15% of the corporate capital of the target respectively. 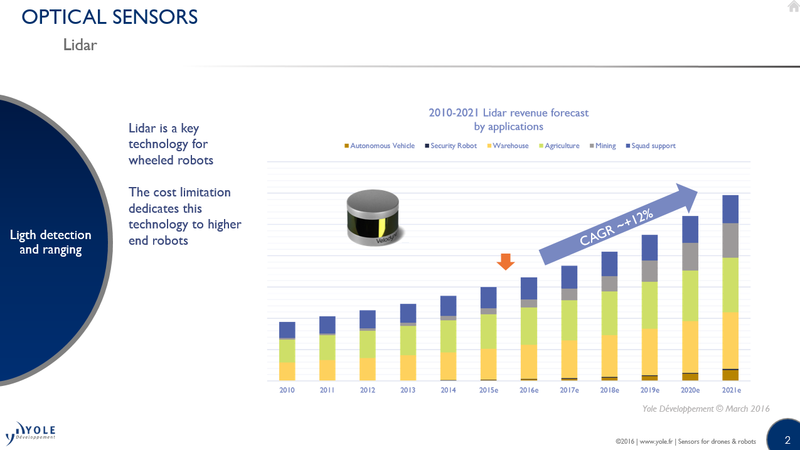 In fiscal year 2015, LFoundry revenue was 218M EUR. LFoundry’s capacity is 40,000 8-inch wafers per month. 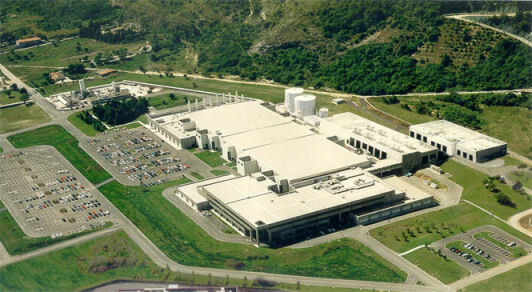 LFoundry used to be Micron's fab manufacturing image sensors for Aptina and continues it now as an independent foundry. At the same time, LFoundry offers 110nm CIS process on the foundry basis. Thanks to ESG for the link! "Our core product is the Silicon Photomultiplier (SiPM). The SiPM is a solid-state sensor that is closely related to SPADs (single photon avalanche diode). A simplistic description of SPAD is a binary photon-activated ‘switch’. An SiPM is formed of a close-packed array of SPADs with a summed output. This summed-matrix of SPADs, that forms the SiPM, acts as a quasi-analog sensor that retains single-photon sensitivity upon a large surface area. SiPMs have very high internal gain and therefore do not require external amplification that would contribute additional noise to the signal. Therefore the SiPM will have a better SNR than the APD in many use cases. The histogramming ToF approach reveals the time-correlated photons that would otherwise be lost in the background noise of the ambient light and is used to extract the distance measurement." Shizuoka University publishes PhD Thesis "A study on low-noise high-sensitivity multiaperture camera with selective averaging" by Bo Zhang. From the abstract: "a prototype 3×3-aperture camera is developed. Under a low-light condition, in which the maximum average signal per aperture is 11e-, the RTS noise and dark current white defects are removed and the peak signal-to-noise ratio (PSNR) of the image is increased by 6.3dB." Proceedings of the Electronic Imaging conference 2016 are available on-line, free of charge, with no registration. e2v announces the Onyx EV76C664 1.3MP global shutter CMOS sensor. The new sensor features an embedded active imaging system which synchronises external illumination and internal electronic shuttering. This allows discernible color images to be produced at extremely low light levels and through diffusing environments (e.g. fog and smoke) by range-gating, making it ideal for Intelligent Traffic Systems (ITS) and security cameras. The sensor has an innovative 10um-large pixel with extended sensitivity and performance in NIR, and can also cater for ‘all-light’ environments (typical of outdoor camera applications) where wide dynamic range is also needed. The new sensor is available in sparse colour and monochrome filter (EV76C664ACT) and black and white (EV76C664ABT). Albert Theuwissen announces a start of registration for 2016 Harvest Imaging Forum "Robustness of CMOS Technology and Circuitry outside the Imaging Core : integrity, variability, reliability." Reliability issues and topics: electro-migration, latch-up, hot-carrier effect, NBTI, soft-errors (by cosmic rays and alpha-particles), electro-static discharge, etc. EETimes: Rambus presented a poster "Lensless Smart Sensors: Optical and Thermal Sensing for the Internet of Things" at VLSI Symposia 2016. 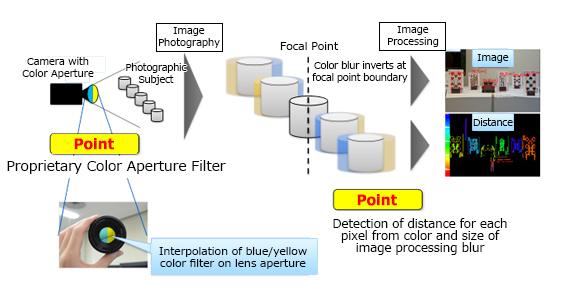 The sensor utilizes a phase anti-symmetric diffraction grating on top of a conventional pixel array and computational algorithms that extract the relevant information from the image. "In some applications such as range-finding or eye-tracking, it may not even be necessary to reconstruct a full image. Instead, extracting distance measurements may suffice and the particular phase anti-symmetric diffraction structure makes it very simple, explains the poster. 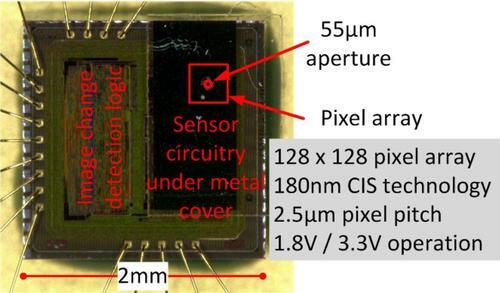 The ultra-low power 2x2mm2 image sensor with a 128x128 pixel array and integrated image change detection circuitry on the same die was enough to measure distances up to 50cm with an error of less than 8%, they reported." "We do see this as a better, more accurate replacement for head-mounted eye tracking systems like those found in Virtual and Augmented Reality systems. We don’t target the LSS product for remote eye tracking, such as PC display or television based implementations", said Paul Karazuba, Director of Product Marketing for Imaging at Rambus. "Sony is currently prototypeing Image Sensors based on SiOnyx or better known as “black silicon”. Basically it uses a porous silicon etch on the front side to reduce reflectance. However, while this works well in reducing the visible light reflectance of bare silicon wafers with no backside layers or materials from 46 % to a few %. For image sensors a sensitivity invrease of 30% is estimated." SoftKinetic announces it has been named a finalist for the prestigious Car HMI Award, part of the Car HMI conference taking place in Berlin, June 20-21, 2016, for the automotive ToF-based gesture control interface. PRNewswire: Seek Thermal announces the company's line of high performance, affordable, infrared thermal cameras for experts and contractors in industrial and commercial building trades. The CompactPRO is said to be the first thermal imaging camera built for a smartphone to ever feature 76,800 measurement pixels, a thermal sensor array of 320x240, and an unprecedented price point under $500. The camera has less than 70mK sensitivity. "The pervasive tendency in the industry is a transition from component-level thinking to system-level, where the products and applications are considerably more than the sum of their parts. This calls for: glass-to-glass thinking for the video chain (for viewing), and; glass-to-bit appreciation (for machine vision). These instincts must be further widened in multi-sensor architectures that support sensor fusion to include photon/phonon-to-bit thinking. The day of daisy-chaining black boxes to make an automotive product is gone and stakeholders in the video chain need to have an appreciation of, and accommodation for, the interaction of the elements which originate both inside and outside of the automotive industry." 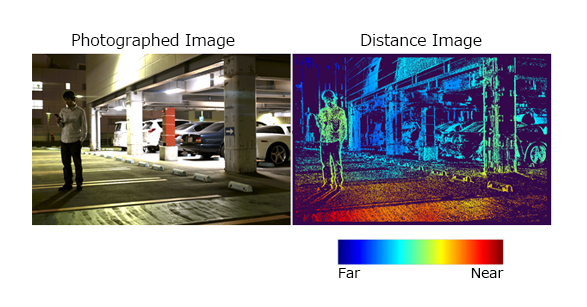 "A typical colour megapixel automotive camera generates a data bit for every man, woman and child on Earth in under 6 seconds and is connected in turn to multi-sensor systems that perform ever more complex processing, and this is the tip of the data iceberg among the sensor fusion systems on a vehicle. The introduction of cameras on to vehicles caused a leap in the volume, variety and velocity of data available to the vehicle and a rock solid mathematical appreciation of how these data sets work is vital for automotive technologists trying to make product differentiators." Now, automakers want autonomous cars that can operate without a driver – much sooner than later, according to Mobileye. In keeping up with its customers’ more aggressive timetable, Mobileye has also “slightly pulled forward” — to 2020 — its plan for EyeQ5. [Elchanan Rushinek, Mobileye’s SVP of Engineering] said that EyeQ5 was designed to support more than 16 cameras in addition to multiple radars and LIDARs, including the low-level processing of all sensors. BGR quotes a rumor that the upcoming iPhone 7 will not have dual camera: "Apparently, an unnamed Foxconn employee told people that the dual lens camera in the iPhone 7 Plus has been canceled because of “immature technology.” It’s not clear what that means, or whether the claim is even accurate." ALA News: ULIS announces the selection of its VGA 17um Gen2 thermal sensor in Bertin Technology’s FusionSight camera. “Bertin Technology’s choice of ULIS’ VGA 17µm 640x480 thermal image sensor is further evidence of the true competitiveness and sustainability of our 17 micron Gen2 products, designed to offer peak performance, environmental hardiness and reductions in the overall cost of system ownership,” said Emmanuel Bercier, senior marketing manager at ULIS.